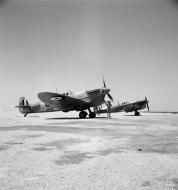 Two Supermarine Spitfire Mark VB(T)s, AB326 and AB345, running up their engines at Helwan, Egypt, shortly after their arrival from Takoradi, Gold Coast, on the West African Air Reinforcement Route. Both aircraft were immediately passed to No. 145 Squadron RAF, the first unit to be equipped with the Spitfire in the North African theatre. The outgoing Commanding Officer of No. 145 Squadron RAF, Squadron Leader N F Duke (left), stands with the unit's new CO, Squadron Leader S W F Daniel, at Fano, Italy. Duke departed the Squadron as the top-scoring fighter pilot in the Mediterranean theatre, having achieved his final victories on 7 September 1944 (two Messerschmitt Bf 109s near Rimini), to achieve a total of 26 and two shared enemy aircraft shot down. 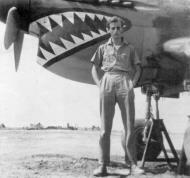 Daniel arrived at Fano with a total of 16 and one shared victories, and commanded 145 Squadron until the end of the War. A engine mechanic at work on a Supermarine Spitfire Mark IX of No. 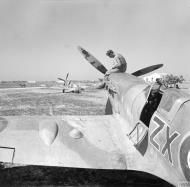 145 Squadron RAF at Pachino, Sicily, shortly after the Squadron arrived there from Malta. A Royal Engineers sapper in a streamroller levels the surface of the airfield at Pachino, Sicily, after the retreating Italians had ploughed it up with deep furrows, as a Supermarine Spitfire Mark VB of No. 145 Squadron RAF takes off for its first patrol following the Squadron's arrival from Malta. Groundcrew of the Advanced Servicing Unit dismantling Supermarine Spitfire Mark IX, EN459 'ZX-1' of the Polish Fighting Team, attached to No. 145 Squadron RAF in Tunisia, April 1943. The aircraft was damaged on 6 April 1943 when, after shooting down a Messerschmitt Bf 109, it was attacked by another Bf 109 and hit in the engine. The pilot, Flight Lieutenant Eugeniusz Horbaczewski, was able to glide in to Gabes for a forced landing. Supermarine Spitfire LF Mark VIII, JF503 'ZX-F', of No. 145 Squadron RAF is serviced on a dispersal covered with pierced steel planking (PSP) at Canne, Italy. Supermarine Spitfire Mark IXCs of the Polish Fighting Team (Skalski's Circus) attached to No. 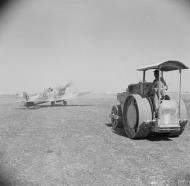 145 Squadron RAF, run up their engines at the Goubrine airfield in Tunisia, April-May 1943. In the foreground is EN315 'ZX-6', flown by the unit's Commanding Officer, Squadron Leader Stanisław Skalski, with EN261 beyond. Squadron Leader L C Wade, commanding No. 145 Squadron, sitting in the cockpit of his Supermarine Spitfire HF Mk VIII at Triolo .Squadron Leader L C Wade, Officer Commanding No. 145 Squadron RAF, sitting in the cockpit of his Supermarine Spitfire HF Mark VIII at Triolo landing ground, south of San Severo, Italy, shortly before the end of his second tour of operations in the Mediterranean area, where he had become the top-scoring fighter pilot with 22 and 2 shared enemy aircraft destroyed. He was promoted Wing Commander and joined the staff at Headquarters, Desert Air Force, but was killed on 12 January 1944 in a flying accident at Foggia. Pilots of No. 145 Squadron RAF grouped in front of one of their Supermarine Spitfire Mark VIIIs at Triolo landing ground, south of San Severo, Italy. The Commanding Officer, Squadron Leader L C Wade, is standing second from right. Ground crews at work on Supermarine Spitfire Mark IXs of No. 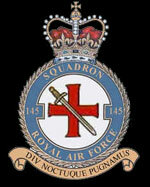 145 Squadron RAF, at Pachino, Sicily.